Product code: O13 Categories: Accessories, Blues, Creams & Whites, Cushions, Libra. 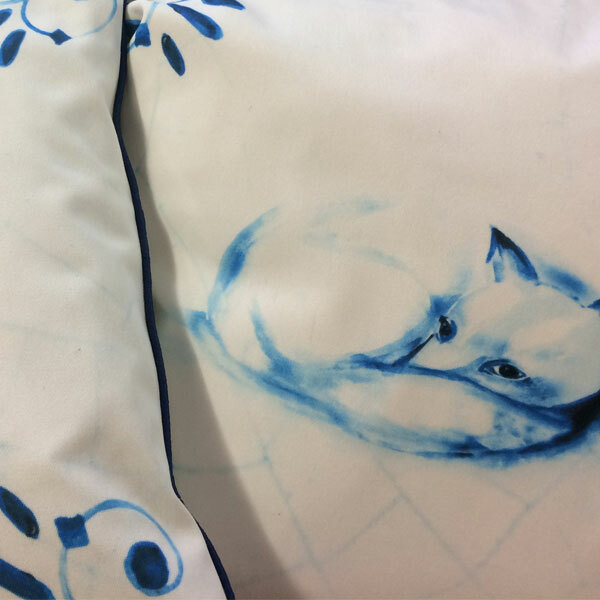 Fox Blue by Libra makes use of only blue and white colouring to create this watercolour inspired design. The body of the cushion is white with a crackle of blue. The main feature image is a fox curled up in the centre of the cushion. Each corner has been decorated with a filigree design also in blue. This square cushion measures 16″ by 16″. The fabric used to make Fox Blue by Libra is a cotton. The cushion has been feather filled. Other designs available in this range are owl and rabbit.